Same Lynx ... Different Year. 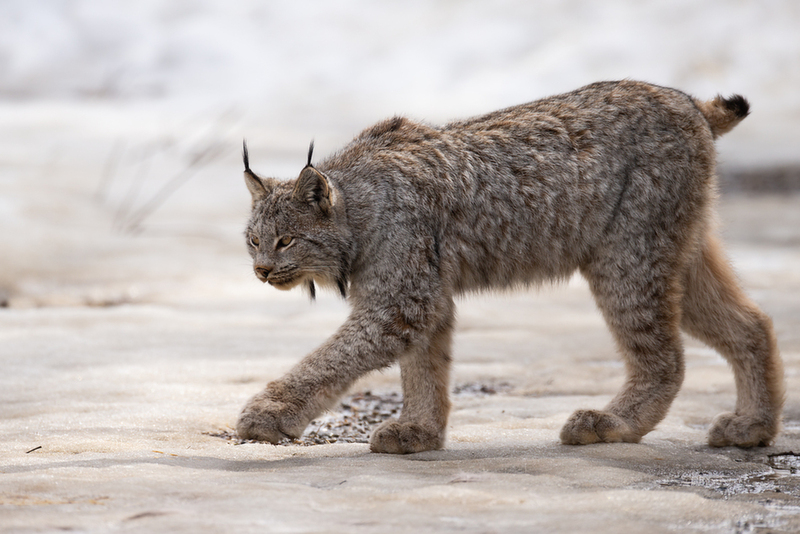 The post I did about a week ago showed this lynx from a photo we took just over a year ago. Today my wife & I drove out to the same spot because we knew there was a deer carcass at that location. We've been snowshoeing in the area since mid-February, but the carcass was frozen solid and no animals were near it for over 4 weeks. The past week was unseasonably warm, so we drove out and hoped for the best. Got to the spot and waited all of 5 minutes before this lynx appeared. I have a few close up shots from last year, and managed a few from today also ... on his nose, there are two very distinctive lines and a small black spot. So it's the same lynx, but one year later! Pretty exhilarating experience. Lighting does strike twice after all. This is an excellent detailed photo of a lynx, what a stunning animal. Lynx body proportions seem all wrong, the head is too small, the feet too big, the hind legs too long, the tail too short - but it all works. What a thrill for you, Pete - and what a lovely capture of this beautiful cat. Great story — killer image! Congrats. Perhaps along with Wolverine, the North American mammal I'd most like to see some day. What a terrific photo! "Animal instinct is more amazing than human ingenuity." Stunning photo- and what a wonderful opportunity. I love how distinct the black markings are on the ears and "beard". What an amazing animal. brilliant image Pete! nice one!